Excavations uncovered the remains of highly urbanized and modern towns at Harappa, Kot dijji, Mohenjo-Daro etc integrated as Indus Valley civilization (2800-2600 B.C.). This era is generally praised for its seals, jewellery and town planning; also shows great progress in metallurgical techniques of bronze, lead, arsenic bronze and Copper. Although main emphasis was on trade, but the artisans adopted several exquisite techniques to manipulate different alloys for usage in sculptures, ornaments, tools and also created motifs which are still being used in customized versions in various South-Asian regions. Indus valley metallurgists used metals such as copper, lead, gold, bronze and silver. Several crucibles of copper slag are discovered which marks the beginning of metallurgy. Most of the beads found are coated with copper glaze which must have been melted in a 1000 degree temperature kiln (Mcintosh) and perforated with thin copper wires. The beads are used in various areas for stylization purposes till date in sub-continent. Gold and silver were employed as ornaments in this era. Globular and jasper beads of gold found are still being used in Gujarat by women for hairstyling. Gold necklaces even less than 0.25 mm in diameter are some of the technological advancements in gold (Lothal) Fig1. The gold pendants found with inlaid gems are still quite common in sub-continent generally referred as “Tika” Fig2. Silver was separated from lead and hammered into sheets. 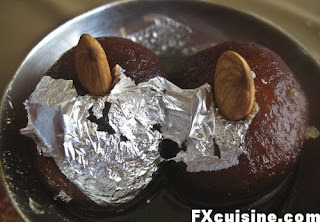 The art of hammering gold and silver in thin sheets is visible even till date in the sub continent where people use Silver and Gold foils to garnish their sweets Fig3. 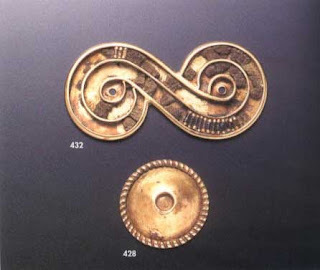 The evidence also shows that lead alloy with copper and bronze was utilized in Indus valley (2500 B.C.). Credit for development of various alloys in the south-asian countries also goes to Indus Valley civilization. They vigilantly made alloys such as Tin, Arsenic bronze and bronze by smelting copper with other metals (Claus). Bronze was extensively used in making sculptures. 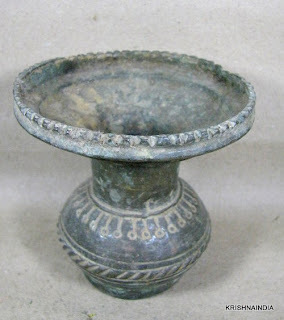 Bronze was also used by mughals for making pots and copper for basins and are quite common till date Fig4. They introduced metallic sculpture casting techniques for the first time in South-Asia. One of these is the french “Cire-Perdue’ meaning ‘Lost-wax’. This technique uses Bronze alloy to cover the clay mold (Bronze). The symbolic bronze sculptures of this era seem to be an inspiration for different cultures where they are worshipped and have been modified into complete religious characters. 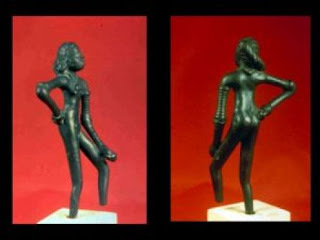 One of the finest examples of Bronze Sculptures found from layers of Indus valley is the “Dancing girl”Fig5. The dancing girl is a masterpiece in terms of fluidity in curves and lines. The girl symbolizes a woman in a dancing posture made from Bronze, solid and compact. Bronze sculptures were later used extensively in various periods for religious purposes. Most of them seem to be an inspiration from the Dancing girl in terms of technique and the Yogic postured deities found on Indus seals in terms of depiction. Thus an amalgamation of religion and metallurgy can be seen in them. 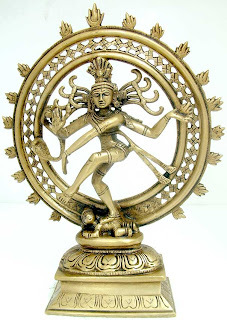 People suggest that later in 9th and 10th century Chola bronze period, Dancing girl was used as an inspiration in the form of Cosmic dance of Siva (Mankind) Fig6. Similarly, Yogic figures of Mahavira from 6th to 12th century are made by using Lost-wax technique and the posture is quite similar to yogic-deities of Indus Valley Fig7. Various forms of lord Shiva and Vishnu bronze sculptures are also found at Thanjavir from Tamil Nadu from 8th to 16th centuries Fig8. All these figures use Lost-wax as per the technique is concerned. Motif of dancing girl and Yogic deities seems to be source of inspirations for these religious characters. Thus, Metallurgy developed as a skill in Indus valley civilization. Various forms of Gold and Silver Ornaments found are quite similar to what are used even now. Copper, Lead and Bronze were a sign of an extremely sophisticated metallic system for making tools, sculptures and pots. These sculptures were may be modified and utilized by different regions of the sub-continent for religious purposes. But the highlight of the region’s metallurgy is that the techniques introduced by Indus Valley metallurgists e.g. copper glazes or the Lost wax method were used in the sub-continent even after 1000’s of years. Thus Indus valley paved the way for Future metallurgists and artisans for creating masterpieces. “Bronze Sculpture.” Indianetzone Sculptures. 18 Jul. 2009. Claus, Sarah Mills and Margaret Mills. South Asian Folklore. Taylor and Francis, 2003. “Lothal”. Wikipedia. 17 Jul. 2009. “Mankind’s metallurgical Heritage”. 18 Jul. 2009. Mcintosh, Jane. The Ancient Indus Valley. ABC-CLIO, 2007.